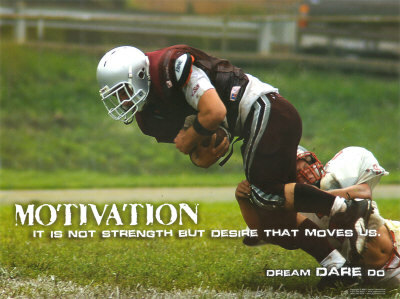 Motivation to do something acts as that driving force which helps us through every phase of an activity. It gives us the energy to initiate the task, then to continue through its ups and downs, and finally also to bring it to an end. Additional motivation always help us to do something better or faster. Or at least that is what you feel happens when you feel that wee bit more motivated. I don’t think I have to give you more reasons to convince you that motivation is an important factor in our everyday lives. I have spent quite some time in trying to understand this mysterious force with a wish to know how can I harness it better. Some negative sources: peer pressure (if she can do it, why not me? admittedly it can be a positive force sometimes), fear of failure (almost always bad and which causes so much anxiety). Some of these sources may have struck a chord with you (like the one in the picture). And may be that after reading this short list you may not be surprised because they are very commonly the sources of motivation that many people use. But my exploration has helped me find an additional source of motivation. One that I have used many a times unknowingly. That source of motivation comes from my constant quest to find a new source of motivation. It’s as if I treat my motivation to do something as drawing from a motivation bank. And because I treat it as a bank, I tend to look for sources that can replenish this bank. A friend told me that she had a three-tiered approach to motivation: First is motivation from the cause itself, but this is simply not enough to sustain motivation indefinitely in all situations, so the second layer was motivation from fun: the work itself should be enjoyable, but it’s just not possible to always make work fun, so the third tier was friendship: that you would work through tough times buoyed by friendship with colleagues and co-workers. Have you got any sources of motivation that you could share with us? Nice post, and such an important topic. One thing I wanted to add is that I think we can leverage negative sources of motivation in a positive way. Particularly entering into bets (that you will/won’t do something) can really make a difference, supposing you can find someone to take up a bet with you. Peer pressure, too, can be leveraged. Go out and tell people what you intend to do, then that’ll put some peer pressure on you to live up to that, which in turn can be a source of motivation. Even anxiety: a lecturer from Adelaide told me that if he didn’t feel a little nervous before giving a lecture (even after 15 years in the job) then the lecture wouldn’t be as good as it could be, since a little anxiety drove him right to the edge of his performance. Perhaps we should be concerned if we’re not nervous before an interview or other important task: no anxiety means we’re not going to be quite as perfectionist as we could be. I have had a weight problem for quite sometime, and have tried different tactics to try to lose weight. I often find it hard to be motivated until I got 184 Secrets of the Thin because it showed me that I need to make only small easy changes to my lifestyle that are really not hard to do. Currently, I’m taking a motivational class. One source of motivation I have not yet seen, but do believe it should be included is the psychological and compulsory sources of certain illnesses or disorders. Often people suffering from multiple personality disorder will make statements, I did it ‘because’ the voices told me to. The causes of the behavior is direct result of an individual ‘belief’ in an imaginary aspect, that is thought to be ‘real’. The compulsory sources — would include incidents like: “I don’t know why I stole the bracelet, I just did.” Again, the source is a psychological source that can be unconscious causing a person to do certain behavior. that is just my two cents I would like to throw in. I simply want to be a better capitalist. More money is my motivation.